TUCSON, AZ – The Tucson Roadrunners, proud American Hockey League affiliate of the Arizona Coyotes, have partnered News 4 Tucson’s “Season 4 Hope” campaign and the Community Food Bank of Southern Arizona to collect donations for those in need this holiday season. At the Roadrunners game on Tuesday, December 12 at 7:05 against the San Jose Barracuda, fans are encouraged to bring non-perishable food items, new toys and clothes, all of which will be donated to the Community Food Bank of Southern Arizona, Toys for Tots and Goodwill. All three community partners are supporting the ninth annual “Season 4 Hope”. 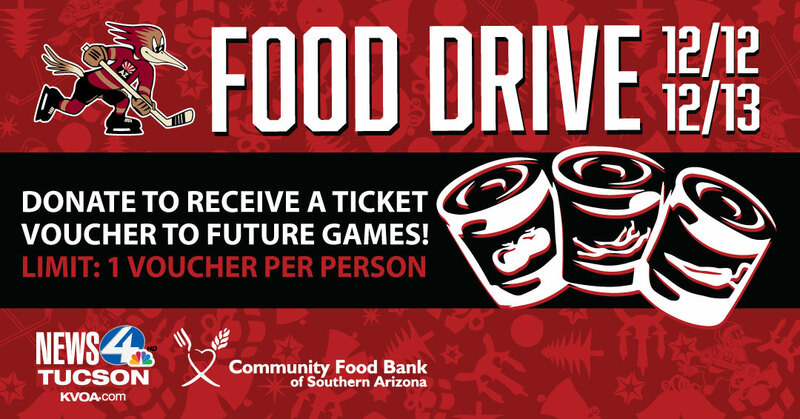 Wednesday, December 13, the organization will also be collecting the food items when the team takes on the San Jose Barracuda at 7:05 p.m., which will be donated to the Community Food Bank of Southern Arizona later in the week. Vouchers can be redeemed at the Roadrunners offices (175 W. Broadway, Tucson, AZ, 85701) or by calling the Roadrunners at 866-774-6253. Tickets for all 22 remaining Roadrunners home games, including games next week, are on sale now and can be purchased by clicking HERE or visiting the Tucson Convention Center box office.